This is my first official review for Batman Beyond, but if you take the time to check out our Upcoming Comics post each week, then you know I’ve been praising this book for a while now. Dan Jurgens, Bernard Chang, and Marcelo Maiolo have been killing it, and along with Injustice and Detective Comics, this is easily one of the most enjoyable books we’re covering at the moment. There are times that creative teams mesh so well, that it’s hard to imagine a book with anyone else. This is one of those instances. Early on in this book’s run, I wasn’t so fond of the direction considering it was a continuation of Futures’ End – and you all know how I felt about that event – but ever since Batman Beyond has had the opportunity to create its own identity and stand on its own feet within the Batman Beyond universe, it’s been an absolute blast! Each issue has been the perfect balance of character development, plot development, and action. There have also been an abundance of twists and reveals lately that are almost guaranteed to get sucked in… Your wallet might hate you, but you’ll be happy you took the time to see what’s going down in future Gotham. At the moment, Tim Drake is operating as Batman, after taking the mantle following the death of Terry McGinnis back in Futures’ End. Bruce Wayne is no longer in the picture, and his lack of a presence is still a mystery to readers. Similarly, details pertaining to this timeline’s Tim Drake are also a mystery that Batman himself was never able to uncover. There have been references that Tim most likely died, but you know what they say, “Don’t believe they’re dead until you see a body.” Even then, these are comics we’re talking about, so death doesn’t carry much weight even when you do see the body. Regardless, there’s a possibility that this mystery could come to play into the future, and that’s something I would love to see. Most of Batman Beyond’s run up to this point has focused on Tim coming to terms with this new world he’s in. With no foundation to really grasp onto, Tim has made a point to build relationships with anyone that feels familiar to him. One of these people in particular is the former Batgirl and current police commissioner, Barbara Gordon. Serving as Tim’s backbone, Barbara continuously steps in to fill in the gaps pertaining to history, and updates the new Batman on this time period’s rogue gallery. Together the two have been confronting and stopping crime in a manner that is reminiscent to when the two both wore masks. It’s incredibly fun, and highly nostalgic considering both of the characters’ circumstances. The antagonist wreaking havoc on Gotham at the moment is Rewire. In a brilliant turn of events though, we recently learned that the man behind the mask is actually Terry McGinnis under the control of Spellbinder. This chapter kicks off with a group of thugs trying to rob a pharmacy during one of many rolling blackouts across the city. 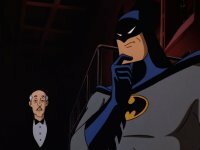 Batman, Barbara Gordon, and the GCPD are quick to the scene, but as more instances of burglary begin to occur, it becomes clear that these aren’t just coincidences. After Batman and Barbara decide it will be best to divide and conquer, Rewire and Spellbinder put their real plan into play. As the outcome starts to look bleak, Matt takes it upon himself to assert himself into the action, which may or may not play right into Spellbinder’s hands as another hero falls under his manipulation. As we’ve come to expect from this title, this issue is high energy, action packed, and packs a wallop. More reveals are made, and additional lines are drawn in the sand as Tim continues to fight for Gotham. If you thought the previous issues were great, then you’ll love this one as well! And if you’re anything like me, you’ll be frustrated when you reach the end of the issue… but only because you’ll want more! The Art: I have to take a moment to praise Bernard Chang and Marcelo Maiolo! Bernard is an incredibly talented artist with a unique style that helps give this book a specific voice. I’ve discussed this in the past with Karl Kershaw on Gotham Academy and ACO on Midnighter, but there are times that artists find a way to sync their style with the title itself. Yes, I will admit that there were times early on where I found myself unsure of Chang’s style, but it has since grown on me to become something I love! Add in Mercelo’s bold color choices, and you hit a home run! The Good: Pedestrian in lane up ahead. The entire sequence where Rewire stops Barbara Gordon was outstanding! Not only did it look spectacular, but it also read incredibly well. I knew what was going to happen the moment Barbara and Tim separated, but it didn’t take away any emotion or suspense in the scene. Everything about this moment felt cinematic, and it had me wishing I could witness this on the big screen at some point in time. Compromised. Yet another moment that was slightly predictable, I’m still overjoyed with the outcome of Spellbinder taking control of Barbara. Yes, it’s cliché, and yes I think we all saw this coming from the beginning of this issue, but it works well because of what it means for Tim now that it’s happened. Without Barbara, I’m not sure if Tim would have lived to survive this long in this world. Even up until this point, Tim has continued to rely on Barbara to get by, so the fact that she turns bad just as these two create a stride together, doesn’t bode well for any of our heroes – Tim, Terry, or Barbara. Terry’s reveal. As readers, we’ve known about Terry for about two months now (I believe), but the characters in the story have remained in the dark… until now. With Barbara, Tim, and Matt aware that Terry is alive, their approach will be different than it was going into the confrontation. I can’t wait to see how the respond, especially Matt. The art. Yeah, I’m going to gush a little more. I mean, seriously, how can you have panels like this pop up throughout action sequences, and not be a fan? This is fantastic! The Bad: As we move closer and closer to Batman Beyond Rebirth, I can’t help but find myself thinking, “Yeah, they’re totally going to kill Tim off.” I have no proof of this, it just seems like the easy answer… and it’s an easy answer that I don’t want to see happen. So much momentum has been built with these last few issues, and as poetic or Shakespearian as it might be to kill Tim, I can’t help but feel that it will also destroy some of this book’s momentum. Where most Rebirth titles have felt like a much-needed course-correction, this would ultimately feel like another, complete reboot for this title… I’m crossing my fingers and hoping for the best. Matt, sit down! You know nothing good is going to come out of you racing to help Tim and your brother… You’re probably going to be the reason Tim might (possibly, I’m almost certain) die. Nobody is going to like you for that. Spellbinder. Can somebody knock the crap out of him already? You’re a fan of the Batman Beyond animated series. You like exploring the concept of alternate universes and timelines. Overall: Batman Beyond is one of the most exciting reads from DC Comics, and it’s not getting the attention it deserves! The relationships that have been created within such a short time, as well as the interpretation of this universe, are absolutely fascinating! Come hop on the time machine and enjoy the ride!